A delightful trek through the forest, amazing underground wonders and questionable toilets are all part and parcel of the fun at Gunung Senyum. The park is a part of the Jengka Forest Reserve, which covers an area of 794 hectares. Surrounded by oil palm plantations of the Jengka Felda scheme, there are two main mountains within the park, Gunong Senyum and Gunong Jebak Puyoh, the former being a popular spot to tourist and researchers. Gunong Senyum is made up of limestone and rock, estimated to be around 3,000 years old, whilst the lowlands on the east is made of mudstone and shale estimated at around 2,100 years old. Gua Taman, the cave with a “garden”. You want me to bathe in that?” my friend asked, aghast at the dirty floor of a dark public toilet which stank to high heaven. There were no lights, the sink was filthy and there were no shower facilities. If we were to bathe here, we would have to squat on the floor and use a short hose attached to a tap. After a whole day of caving at the Gunung Senyum Recreational Forest, Pahang, we were looking forward to a nice hot shower. So much for that. “OK, let’s look for something more decent. I’m sure they have shower facilities here,” I assured, as we combed the camp grounds hopefully. After a bit, we stumbled upon some abandoned hostels at the back which had some sort of shower facilities. It had bare cubicles with a plastic pipe at the top, but no shower head. There was dirt all over the floor, cobwebs on the ceiling and frogs perching on the walls. The slimy creatures looked annoyed. “I will kill you if a frog jumps on me,” said my friend, who has a phobia of frogs. But it was this, or we go to bed smelly. We chose the shower. Perhaps the rough conditions were only to be expected, since I wanted to do a spot of caving for the weekend and didn’t want something too commercial. To this end, I had made a call to cave enthusiast Michael Manivanan, founder of outdoor adventure company MMAdventure, for advice. Michael, who takes groups to commercial sites like Gua Tempurung and Mulu, and does a lot of caving of his own as well, suggested Gunung Senyum. 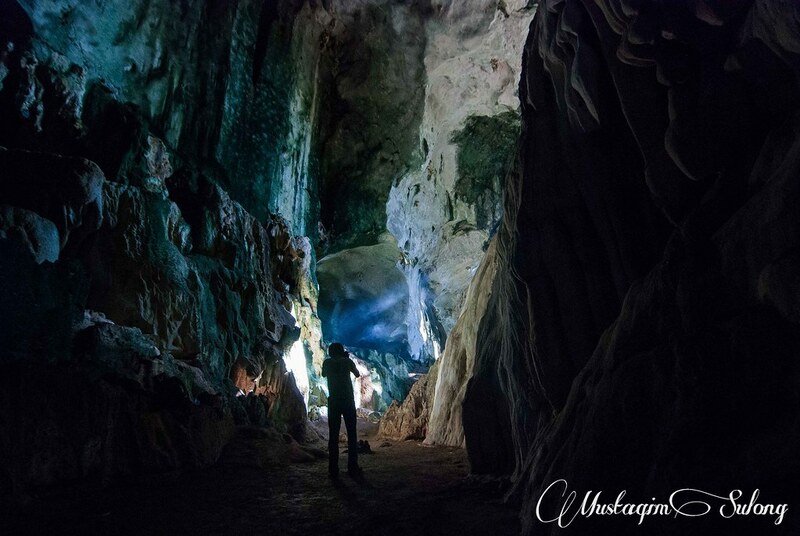 He was there a decade ago to do some cave surveys and mapping for the Malaysian Nature Society. And so we headed to the town of Temerloh, Pahang early one Saturday morning to meet up with Michael, his business partner Ng Shan Wee, and Ng’s girlfriend. The magnificent view at Gua Kolam Tujuh. We reached Gunung Senyum at about 10am, and Michael went to look for the forest rangers for information while Ng prepared the equipment. Being experienced spelunkers, they came prepared with full caving suits, caving shoes, helmets, head torches, carbide lamps, ropes and bolts. These caving experts were clearly excited about the adventure ahead. “Caving is a passion. It is not for everyone, but my greatest joy is to discover an unexplored passageway or uncover a whole new cave,” said Michael. The first part of our adventure was pretty mild as the caves were dry and easily accessible. 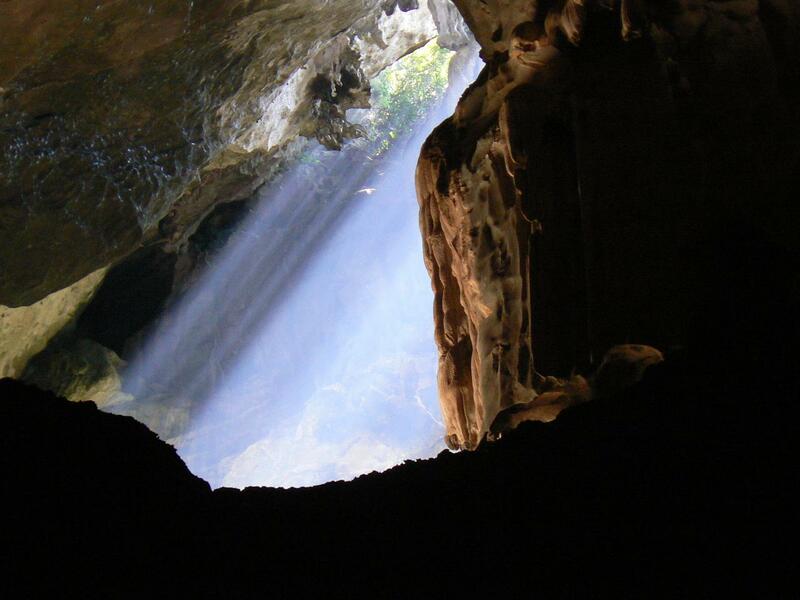 It was actually a cluster of smaller caves linked together by passageways with names like Gua Terang Bulan, Gua Angin, Gua Gajah and Gua Taman. You could walk easily into them, and there was a beautiful garden in the middle of one of these caves since it received direct sunlight. 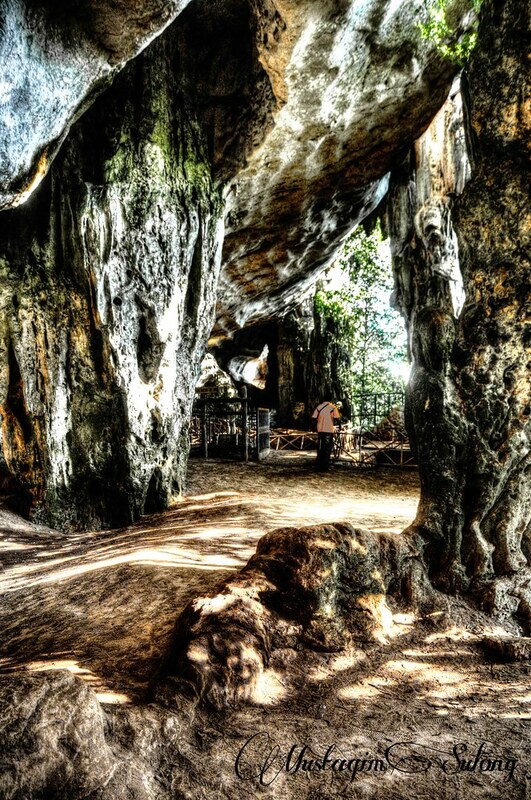 Yes, that would be Gua Taman, the “Garden Cave”. We continued our journey, heading up to the mountain peak, but a sign at the bottom said it would take 6½ hours to get to the top, and since it was already near noon, we thought it best to climb the next day. Next day, we found out that it actually took 6½ hours to climb up and down the mountain. The sign could have been much more clearer, we grumbled. Accessing the rest of the caves further up the mountain required a fair bit of hiking along badly marked trails. Thankfully, Michael was experienced enough that we didn’t have much trouble finding the caves. He taught us a lot about cave formations and how precious and fragile they were. It takes hundreds of years to grow just an inch, for example, so it’s best to be careful about what you touch in here. We did a bit of spelunking towards the end. There was a small crack in the rocks which seemed to go down forever and sounds from a rock we threw in seemed to confirm that. It’s now or never. Stashing our day packs behind a rock, we proceeded to inch slowly down the steep slope on our bums into the gaping darkness. The small crack grew even smaller and we found ourselves lying flat on our backs in order to wiggle our way through. Thankfully, the gap opened up into a bigger hole and we were able to sit upright again. We could feel the contrasting dampness by now and it was a bit stifling underground. The walls were coated in a layer of thin dirt that stuck to every inch of our clothing. “Careful, big gap ahead!” called out Michael. “Look up to your right, see the small hole at the top? You can see a tiny ridge a little further down in front. Place your right hand in the top hole and stretch your right leg onto the ridge. Swing your left leg and grab hold of that small protruding rock. You should be able to clear the gap with no problem at all,” said Michael. It sounded easy, but boy was it tough. For someone with short legs, clearing a gap while hanging on for dear life was no easy feat. Lucky for me, my balance was good and I managed to swing my left foot onto the next boulder and haul my body up. I clung to the boulder for a few seconds, thankful that I survived the death-defying drop below. Ok, maybe I’m being a little dramatic here. The gap was scary but it was not that life threatening. Granted, you might twist an ankle if you fell down but that would be about it. The rest of the passageway was easy going from then on. The space remained small with not one section allowing you to stand at all. We were mainly crawling on our knees or slithering along on our bellies. There were times when I thought some of the bigger-bodied ones would get stuck but everyone crawled through easily. Fat is compressible, you see. A word of caution: do not descend into a cave by yourself unless you are accompanied by an experienced guide. It is no fun being stuck underground in complete darkness. In fact, it’s terrifying, but if you’re with an experienced guide, crawling on your belly and squeezing through holes you never thought possible to get through can be quite exhilarating. We woke up bright and early to chirping birds the next day. After a hearty breakfast which Michael and Ng cooked on their portable stove, we suited up for another day of cave exploration. We hiked for about an hour before we reached the first caves of Gunung Jebak Puyuh. The caves here were relatively big, with soft, sandy soil. Michael and Ng wanted to explore an opening but had to retreat because the soil was too soft. “We would love to explore every crevice but if it is not safe enough, we will not go through with it. For example, the soil here is very soft and there are lots of fine, loose particles. It might cave in on us if we were to go further down,” said Michael. Most of the caves had no signage, unlike the caves at Gunung Senyum which had a brief history on how the names were derived, so we didn’t know exactly which caves we were exploring. There was one particular cave I enjoyed, a huge cavern that linked several caves together. There were abandoned pathways which would have looked fantastic if they had been maintained but I’m glad in a way that they weren’t as we got to enjoy the natural environment of the cave. I was curious to explore but was too scared to go alone into the darkness until Michael said that all the passageways lead to the main cavern that we were standing in. I told Michael to stay put as he was studying some cave formations while I ventured into a winding passageway with my friend. It wasn’t that difficult as the caves were huge and we could walk straight in. The floors were dry and there wasn’t much debris hindering our movements. True enough, each twisting passage led us back to the main cavern. After going down five passageways and discovering the same thing, I gave up and joined Michael at the huge column in the middle. It was indeed beautiful. And so were the other intriguing cave formations found all around Gunung Jebak Puyuh and the small cave creatures scuttling about. Trekking in the jungles outside again, we also had an opportunity to appreciate the magnificent rare Albino Ara tree. Despite the horror that was the toilet, the trip as a whole was great, worthy of an educational experience. Travel along the old trunk road from Kuala Lumpur to Kuantan, and head towards Temerloh town. Look out for signboards to Hutan Lipur Gunung Senyum. One turn off is by the east end of the bridge at Temerloh, the other one is at Kampung Awah. Gunung Senyum is 40km from Temerloh and 20km from Bandar Pusat Jengka. Light clothing, preferably long-sleeved and pants, flexible shoes with a good grip, flashlights and head torches, helmets and a day pack for food supplies. Expect to get dirty and wet. Hutan Lipur Forest Rangers office, car park, campsite, toilets, surau and rest area. For more information, call the Temerloh Forestry District Office at (09) 296 2755. I’ve been to Gunung Senyum five times so I’m very used to its caves. A great place for those who like spelunking. Previous post: A Colonial Era Railway Station That Still Shines!